Normally, when a financial document is entered in SAP FI module, user has the option of entering the cost center in the financial document. However, when documents are entered from different modules or a cross-module financial transaction occurs, such as from MM or SD, there is no option of entering the cost center in the document. In this situation, the SAP system will derive the cost center through automatic SAP CO account assignment, substitutions, or through default settings made in the primary cost element. The automatic account assignment has to be configured in the transaction code OKB9. For posting made in external accounting, such as for price differences, exchange rate differences, etc., the SAP system automatically checks entries in the OKB9 settings and derives the cost center. If you do not enter a CO object (order, cost center, or project) in external accounting postings made in FI, MM or SD modules and the posting is cost relevant, then the automatic account assignment checks the relevant cost center and makes the posting. The above 3 excluding the company code level are used in cases when the account assignment is needed below the company code level. Additionally, you can also create orders and profit centers as per the business requirements. 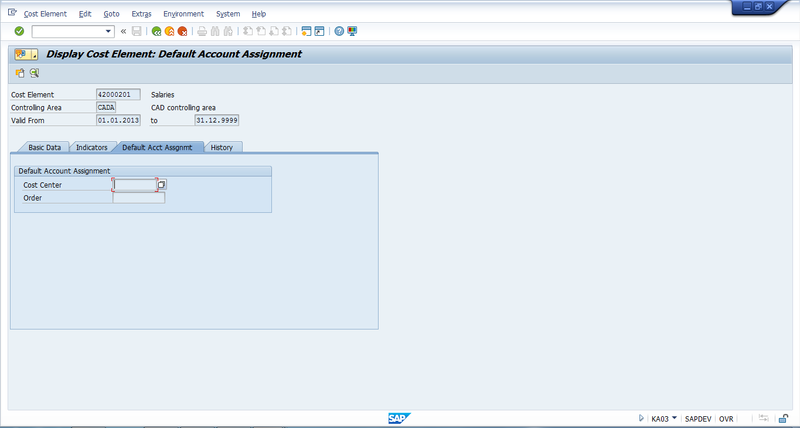 Let’s discuss settings that are possible for automatic SAP CO account assignment in OKB9 transaction. Alternatively, you can start OKB9 transaction directly from the command bar. If you want to have the setting on the company code level only, then enter the company code and the cost element along with the corresponding CO object, i.e. a cost center, an order or a profit center. If you want to have the settings on the valuation area level, then enter the company code and the cost element and chose the ‘valuation area’ option in the account assignment detail as ‘1’. Similarly, if you want to have the settings on the business area or profit center level, then choose the option ‘2’ or ‘3’ respectively. If you have chosen account assignment detail ‘1’ or ‘2’, then click on ‘Detail per business area/valuation area’ on the left sidebar. 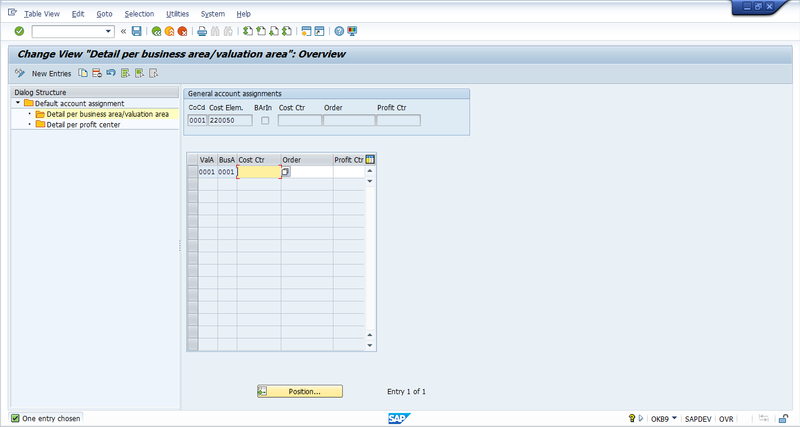 Enter the valuation area and enter the corresponding CO object, then click save button. 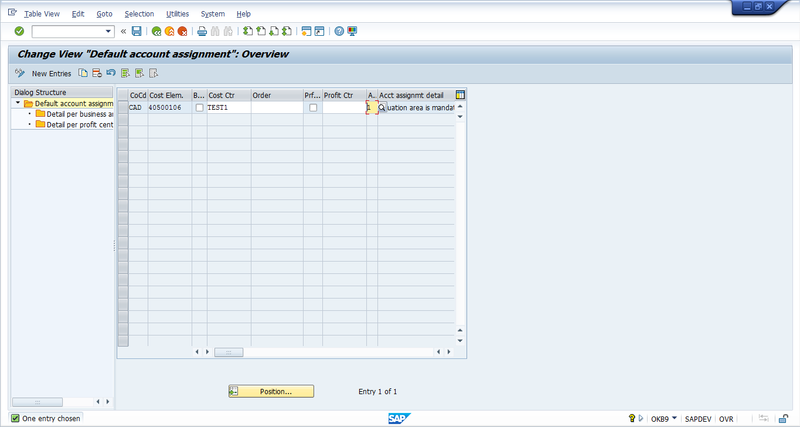 In order to determine the correct CO account assignment, the SAP system performs several checks in the following sequence. First it checks the document which a user is posting. If the cost center is empty in the document, then the system checks if any substitutions are maintained for the particular G/L account. 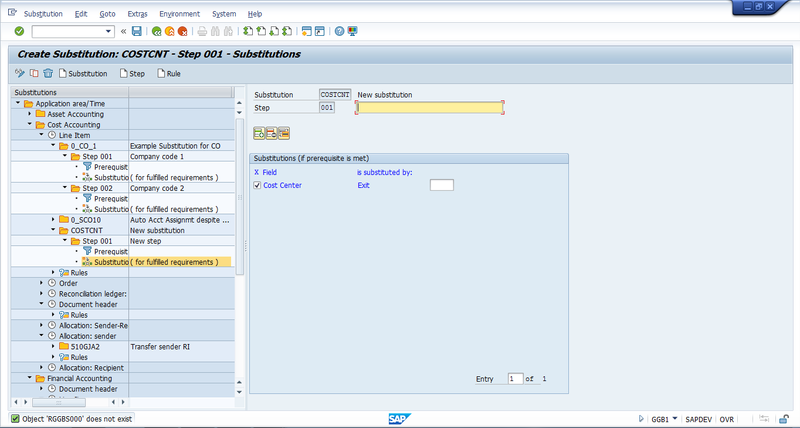 Next, if the substitution is also missing, then the system moves on to the OKB9 settings for automatic SAP CO account assignments. Finally, if these settings are also missing, the SAP system checks master data of the primary cost element (G/L Account) under the tab of Default Account Assignment. You can display this master data using the transaction KA03. You can maintain the cost center and the order in the master data of the primary cost element. Lastly, if any of the above is not maintained, then the SAP system throws an error ‘Account X requires an assignment to a CO Object’ and doesn’t allow posting of a document. In cases where you don’t need OKB9 or default account assignment, the user can go for user exits where a specific G/L account is mentioned under the company and the value in the cost center is substituted by the cost center given in the substitution. The transaction for maintaining the substitution is GGB1. Usage of substitutions for SAP CO account assignment is justified by the business requirement and usually SAP CO account assignment requirements are fulfilled by OKB9 or default account assignments.